Location: West of Southsea Road (B5101) close to junction with New Road. Notes: Plas Power Great Western Railway (GWR) station was on the Wrexham & Minera Railway (W&MR) which was incorporated on 17 May 1861 to build a three-mile line from the Chester & Shrewsbury Railway at Croes Newydd near Wrexham, to Brymbo The line was built to enable locomotive-hauled trains to operate between Wrexham and Minera. An earlier line had opened from Wheatsheaf Junction, to the north of Wrexham, to Minera in July 1847 but it had two rope-worked inclines which, by the 1860s, were an impediment to the smooth working of the substantial traffic that had built up. The new three-mile W&MR line opened on 22 May 1862 for goods traffic only. 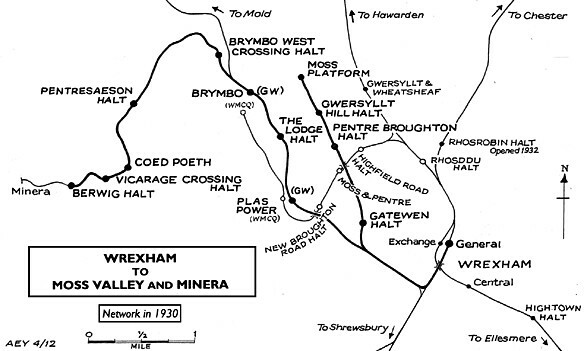 On 11 June 1866 the W&MR was amalgamated as the Wrexham & Minera Joint Railway with the GWR and the London & North Western Railway (LNWR) as part of a scheme to create a direct route between Mold and Wrexham. 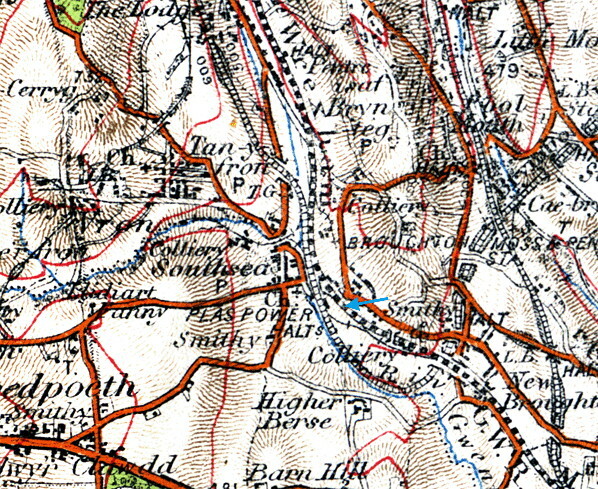 By 1871 the line between Croes Newyyd and Brymbo was solely part of the GWR. The GWR had attempted to start a passenger service on the line in July 1866, but it had failed as the line was deemed not to be up to passenger carrying standards. The line between Croes Newydd and Brymbo became double track on 1 April 1882, and on 24 May 1882 the GWR introduced a passenger service between Wrexham General and Brymbo. In February 1883 an intermediate station was opened at Plas Power, which was a small settlement, but in the vicinity were several mines; the nearest two were Plas Power colliery and the New Broughton Colliery. Plas Power station was on an embankment on the south side of a bridge that carried the line over Southsea Road. It had two platforms of brick construction. On the ‘up’ platform (Wrexham direction) there was a single-storey timber building which housed the booking office, staff accommodation, waiting facilities and toilets. The pitched roof of the building extended a short distance over the platform as a canopy. North of the building was the running-in nameboard. At the north end of the ‘up’ platform a footpath sloped down to Southsea Road. The ‘down’ (Brymbo direction) platform was reached by a barrow crossing at the north end of the station. It was provided with a small timber waiting shelter, and it had a small hut for the storage of railway equipment such as signal lamps. A timber signal box was towards the north end of the down platform. North of the station there were sidings and connections to Plas Power Colliery, which was west of the line. South of the station a connection led to New Broughton Colliery, also to the west. At its opening Plas Power was served by three passenger trains in each direction on weekdays, with extra workings on Saturdays. had to pay for the connection which was needed to allow GWR goods trains to continue to run to Plas Power Colliery. By December 1895 Plas Power GWR station had weekday trains to Brymbo at 9:53am, 2:23pm and at 7:29pm. To Wrexham there were trains at 9:07am, 12:27pm and at 6:12pm. Extra services ran on Saturdays to Brymbo at 5:08pm and at 8:52pm and to Wrexham at 4:32pm. On 15 November 1897 the GWR extended their passenger service beyond Brymbo to Coed Poeth. In March 1905 the GWR introduced a ‘railmotor’ service, and in May it was extended to run west of Coed Poeth to Berwig. A number of halts were opened along the route to make it more convenient for some of the more isolated settlements. In the early years six railmotors ran in each direction, and such was the popularity of the service that at times, particularly on Saturday afternoons, the railmotor had to be replaced with a locomotive and coaches. The WM&CQR had been taken over by the Great Central Railway (GCR) on 1 January 1905; anxious not to be outdone by the GWR they also introduced a railmotor onto their line and opened additional halts. New Broughton Colliery closed in 1910, and its connection south of the station was taken out of use. By July 1922 Plas Power had weekday departures for Berwig at 7.41am, 9:46am, 2:09pm, 3:26pm and at 7:14pm. There were also trains to Coed Poeth at 4:51pm, 5:56pm, 6:59pm, 8:01pm and at 9:06pm as well as services to Brymbo West Crossing Halt at 08:42am and 11:51am. To Wrexham General there were trains at 8:40am, 8:59am, 9:45am, 12:06pm, 1:28pm, 3:03pm, 4:20pm, 5:26pm, 6:31pm, 7:34pm, 8.: 8pm and at 9:41pm. On Saturday afternoons timings were altered, and there was a later service back from Wrexham. There was no Sunday service. 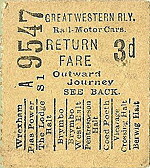 Bus competition had started to make inroads into passenger traffic receipts by the early 1920s. By the early 1930s passenger services on the Wrexham & Minera line were hopelessly uneconomic, so the GWR withdrew them completely with effect from 1 January 1931 and Plas Power closed to passengers. It remained open for goods services. In 1938 Plas Power Colliery closed, causing a reduction in traffic, although numerous through goods services to Brymbo and onwards to Minera continued to run. On 1 January 1948 the Wreham & Minera line became part of British Railways (Western Region). 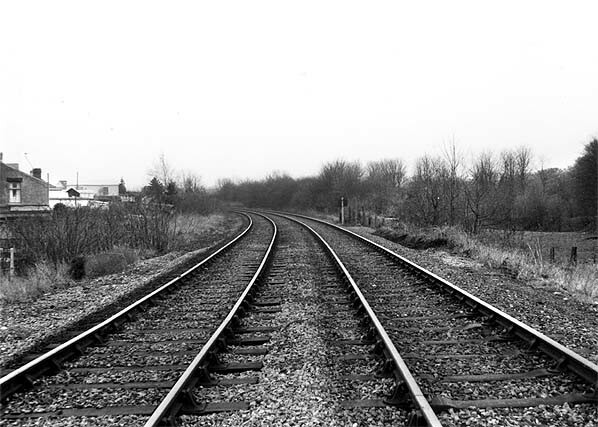 On 30 November 1954 British Railways installed a new connection from the former GWR line to the former GCR line at Plas Power. It was just north of the station and allowed trains to travel up to Brymbo GCR, but from Cross Newyyd Yard. 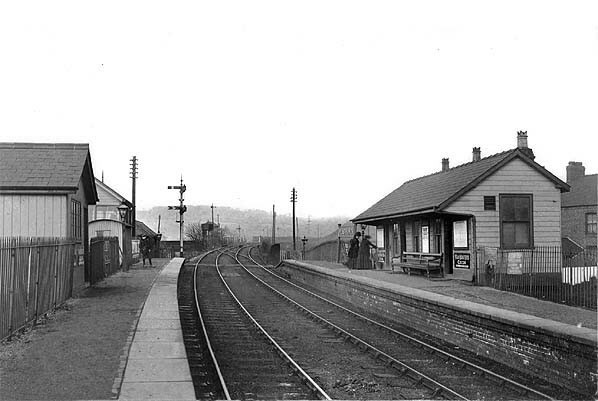 The new arrangement allowed British Railways to close the GCR line from Plas Power to Brymbo Junction North Fork, and the result was that extra traffic ran through Plas Power GWR station. 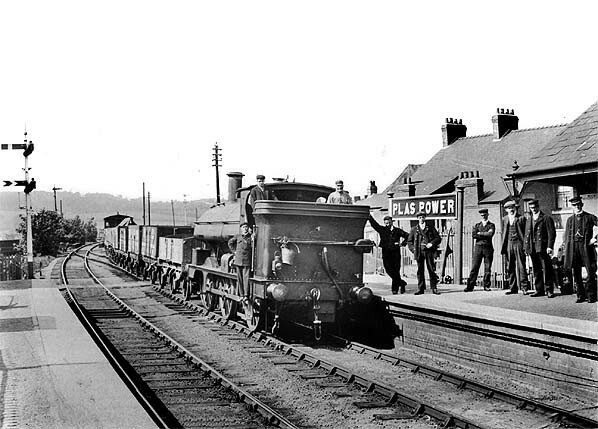 On 2 April 1956 Plas Power GWR station closed to goods services. It had lost its buildings by that time, but the platforms and the signal box still remained. The line through Plas Power remained busy well into the second half of the twentieth century. On 1 January 1972 the section from Brymbo West to Minera closed completely after rail traffic from the Minera limeworks ceased. Trains between Croes Newydd and Brymbo steelworks continued to run. This traffic seemed to be secure, but a national strike by steel workers began on 1 January 1980. The Brymbo works was not part of the nationalised British Steel and continued to work normally, but the railway workers decided to support their striking colleagues at British Steel. They ‘blacked’ traffic from Brymbo for a period of two weeks, during which time the works used road transport, and much of it did not return to the railway. By 1981 all that remained was a daily trip that brought out finished products. By 1982 there were only three trains per week. The last train ran on 29 September 1982, and the line between Croes Newydd and Brymbo West closed completely on 1 October 1982. The Wrexham, Mold & Connah’s Quay Railway including The Buckley Railway – James I C Boyd, 1991, Oakwood Press. Plas Power GWR station looking north-west from the 'down' platform in the early years of the 20th century. The main station building that housed the booking office can be seen to the right. 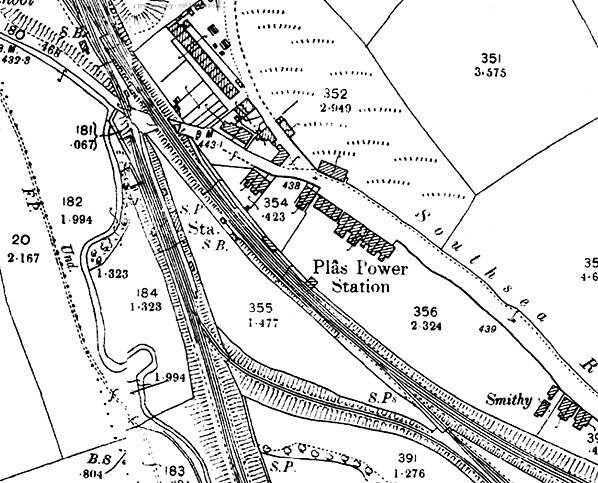 Plas Power GWR station shown on a map from 1899. The GWR station is the one to the right. To the left is the Great Central Railway station. Both stations served Wrexham and Brymbo. 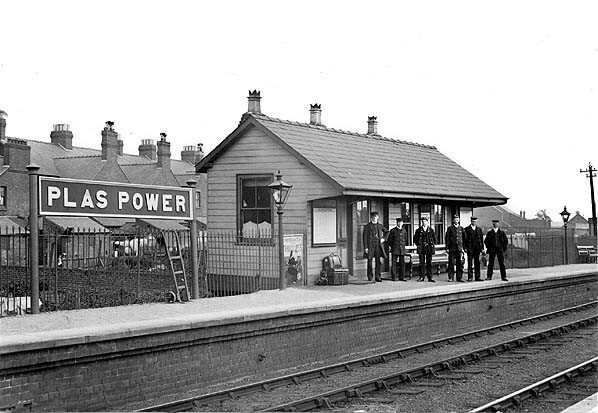 A posed photograph at Plas Power GWR station in the early years of the 20th century. A goods train has stopped, and its crew pose proudly on the locomotive. The Plas Power GWR station staff line up for a photograph on the 'up' platform at Plas Power GWR station in the early years of the 20th century. 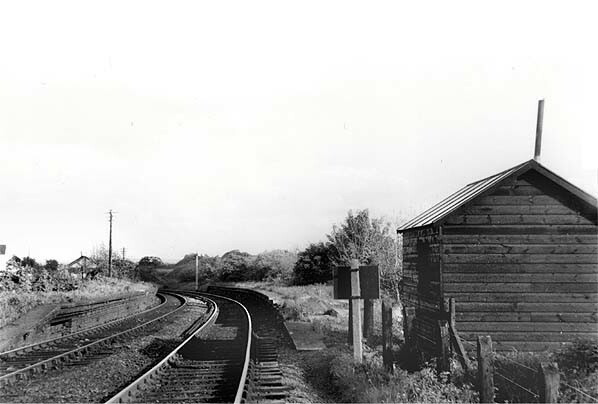 Plas Power GWR station looking north-west along the 'up' platform in 1948. At the north end of the 'down' platform can be seen the signal box that controlled traffic running through the station. In the distance, to the right is another box. It was on the former GCR line and controlled the connection between the two systems. 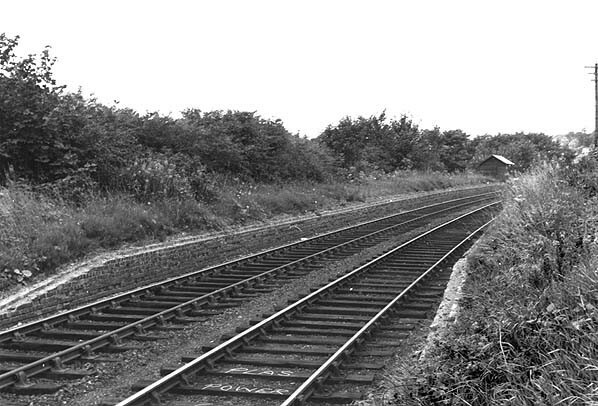 Looking south-east at Plas Power GWR station in 1961. The platforms were extant but the signal box had gone. 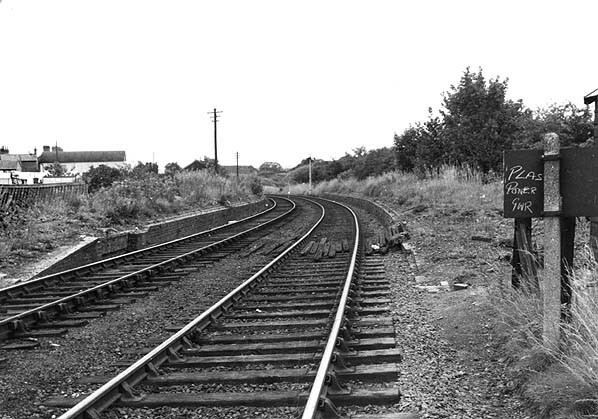 Plas Power GWR station in the late 1960s looking south-east. 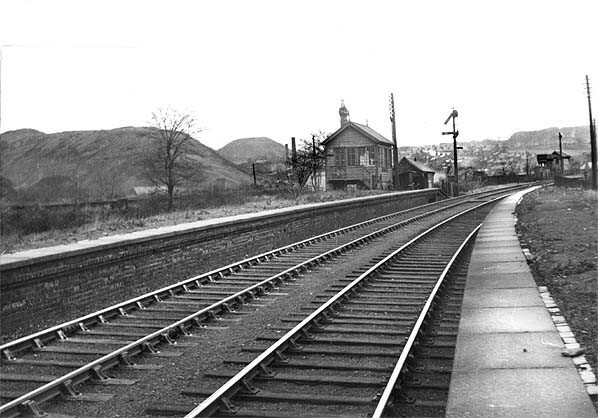 Plas Power GWR station in the late 1960s looking north-west. The site of Plas power GWR station looking south-west in February 1980. By this time the platforms had been demolished. 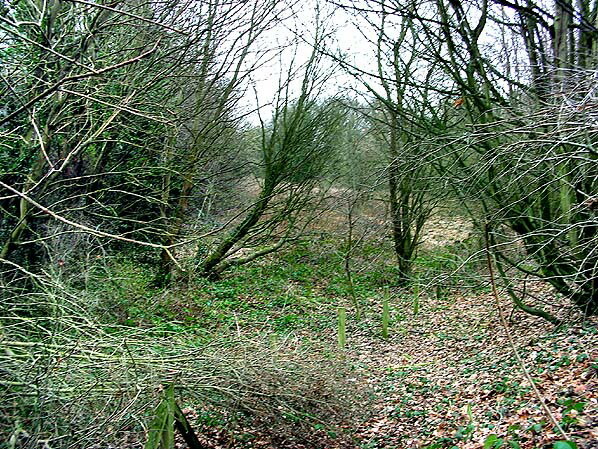 Plas Power GWR station site looking south-east in February 2011.